When the site throws the error: Error establishing a database connection, this usually means there is miscommunication between the database and the files in the file manager. What I like to do from here is open up the Files and Tables section in Installatron. You’re going to compare the four sections in red to the database file in the File manager. You can edit the file right within the File manager, click Edit in toolbar across the top of the screen. From here just make sure that the database name/username, password, and host all match to the Files and Tables section in Installatron. 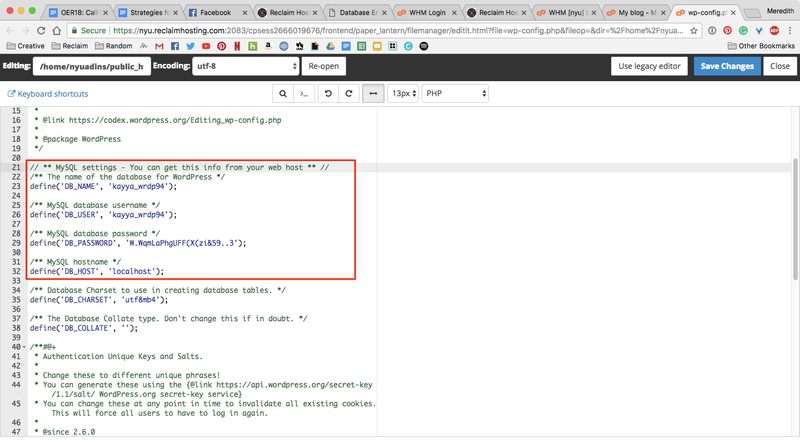 If any are incorrect, you can change them directly in the wp-config.php file. Once they all match, click Save Changes and reload the site.